The design intention was for The Wall to rise up seamlessly from the grass, so there were no real provisions for a walkway. However, members of the design team did attempt to address the issue of storm drainage. They designed a sophisticated system which enabled rain to collect and travel down a concrete trough that ran the length of the walls. Narrow concrete slabs with open slats were laid on top of the trough, allowing water to drop down between the slats and drain away. Much of the grass needed to be replaced, and the Cooper-Lecky team realized that the underlying soil was too hard. Before the resodding, the top soil layer was mixed with sand to help its permeability. For VVMF, the work was managed by the new Executive Vice President, Colonel Robert Carter, a retired Air Force pilot. 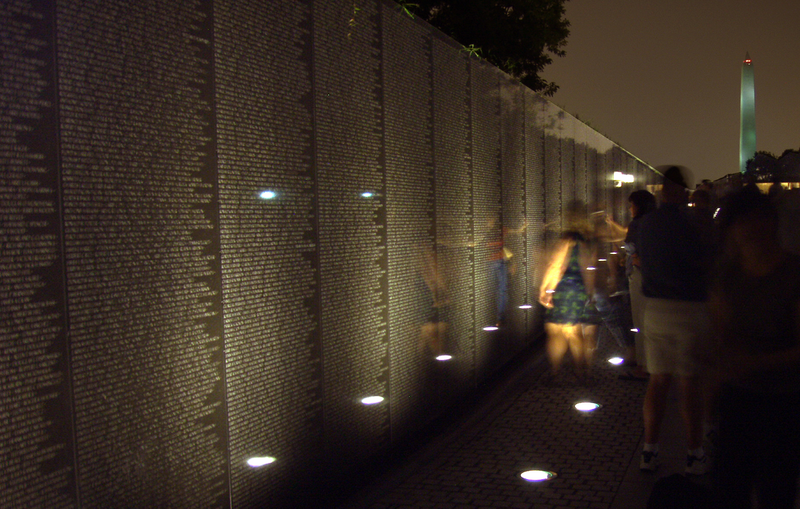 During the ceremonies, the team also noticed that visitors often stood on the grass strip between The Wall and the drainage slabs as they tried to get close enough to touch the names. The grass was soon worn away, and it became obvious that traffic at The Wall was going to be much higher than anyone had anticipated. Cooper-Lecky began planning and reworking the paths. It was always hoped that the Memorial would be accessible to visitors 24 hours a day. For the first two years, volunteer veterans kept a nighttime vigil to light the way for visitors. James “J.C.” Cummings experienced this volunteer corps first hand. Cummings has served as the architect of record for The Wall since 1997, but in those early days, he was a young architect on the Cooper-Lecky design team. He remembers heading down to the site to handle some business one night. As he got closer to the Memorial, he noticed a Vietnam veteran holding a lantern, escorting a visitor to a name. 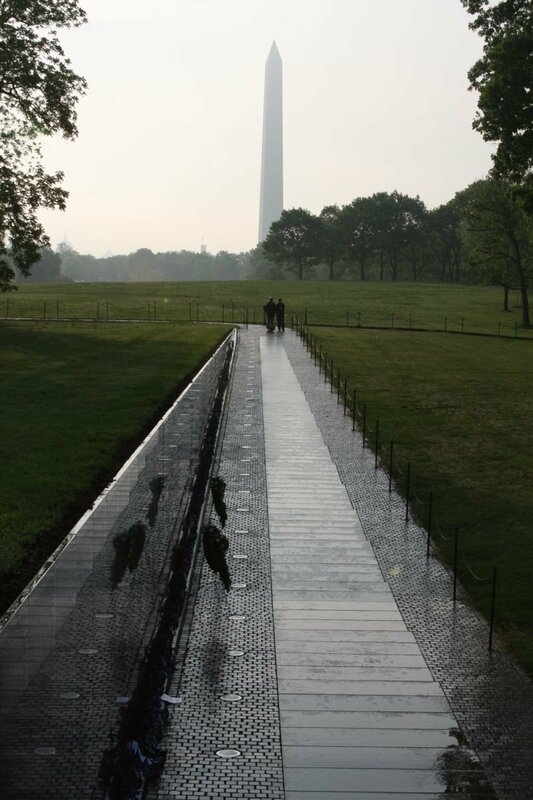 As the veteran and visitor walked The Wall, the lantern swung gently left to right. Cummings noticed the swinging lantern poignantly reflected in the blackness of The Wall. “This particular image was the very expression of ‘service.’ These individuals [were] protecting The Wall, escorting visitors to it, caring for it with such love, and The Wall was reflecting all of that beauty,” he explained. For Cummings, that vision captured all that The Wall was intended to be. “I don’t know if I’ll ever see something that clearly again,” he added. Of course, this was not a long-term solution and, in 1984, a lighting system was installed. It was considered state-of-the-art, but it required a fair amount of maintenance. Lights were set into the ground near the base of The Wall, and water would leak into various components. Because it was a custom-built system, the replacement parts and bulbs were difficult to order. By 2004, after 20 years, it was time to update the lighting. 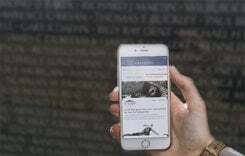 An extensive study was conducted to design a system that would be both easier to maintain and would enhance the nighttime experiences at The Wall. The new $1 million lighting system was paid for by VVMF. Some of the new lighting was to be set into the paving. But it was discovered that the giant concrete drainage trench had not only twisted, it had also settled and sunk several inches. Replacement drainage and paving systems were necessary. To protect the walls from errant equipment and flying debris, they had to be covered completely during the repairs. Work was done on one side and then the other, so that the entire Memorial did not have to be closed to the public. During the construction process, as crews hoisted the old pavers, they discovered hundreds of small objects that had been left at The Wall and had fallen through the paving joints. “It was a very moving situation,” Cummings recalled. “Something as ordinary as picking up a sidewalk led to finding all of those items.” There were notes, religious medals, rings and trinkets. Each day, workers took great care to retrieve the items so they could be catalogued and added to the greater collection. Today, The Wall has a host of individuals and organizations that care about and for it. The National Park Service is its legal steward, while VVMF makes significant contributions to assist in its care. “The volunteers at The Wall are the ‘first responders,’” Cummings explained. 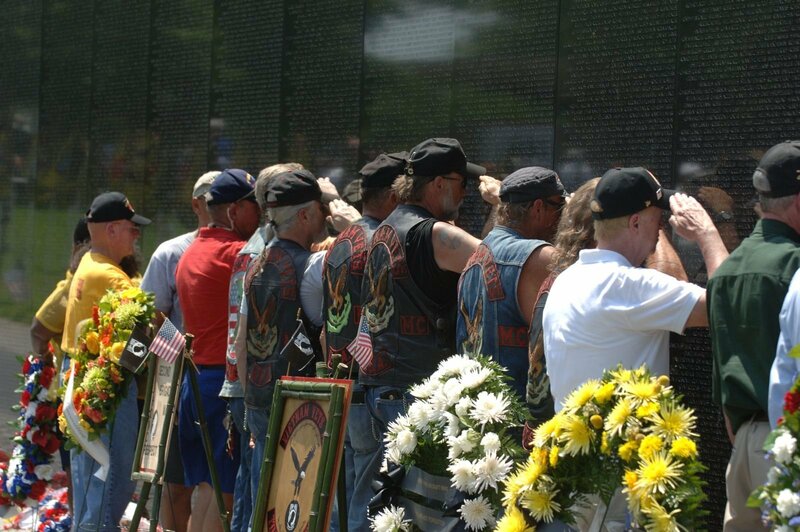 They are intimately familiar with the Memorial and are usually the first to notice when there may be a problem. When they do, they inform NPS or VVMF, so that we can determine the best solution. 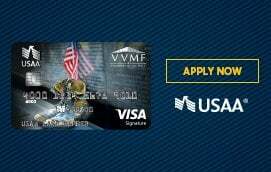 VVMF provides insurance for The Wall. In 2005, it paid more than $1 million to install the new lighting system. Annually, VVMF also pays to have names inscribed on The Wall. In these ways, VVMF has shared maintenance responsibilities with the National Park Service in a model public/private partnership. A detailed care manual developed by Cooper-Lecky guides most of the general maintenance. Since the majority of the Memorial is a park setting, much of the maintenance involves lawn care. One year, dandelions threatened to take over the entire grounds. For the Three Servicemen, NPS waxes the statue each Memorial Day and Veterans Day to protect its bronze finish. 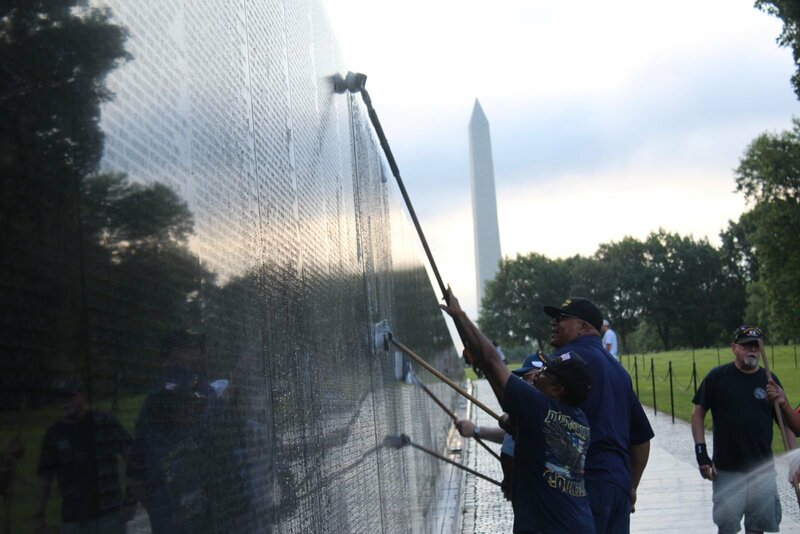 NPS organizes and schedules weekly washings of The Wall by groups of volunteers, from April to November when the temperatures are above freezing. The groups consist of student, veterans, and civic and community organizations from a variety of locations. 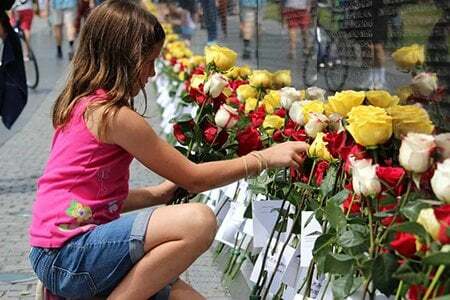 A few years after the Korean Memorial was completed, it too needed some love and care. On their own, some groups of volunteers have gone to the Korean Memorial to clean it, once they were done at The Wall. To Cummings, the tender care that spilled over to the Korean Memorial demonstrates the powerful, positive impact The Wall has had on its surrounding neighborhood and the community.